Ottawa Structural Residential Services Ltd. in Ottawa, ON is a reliable foundation contractor. Keeping your basement dry is our business! Ottawa Structural Residential Services Ltd.
Saturdays, Sundays and public holidays please leave a message. A customer representative will contact you as soon as possible. Clay soil conditions are a hazard for the Ottawa-Carleton area. These expansive soils are highly susceptible to change as a result of moisture, and can lose moisture and shrink in volume, or absorb moisture (like a sponge) and swell in volume. These changes in moisture content can cause disproportionate foundation settlement and damage. Trees can be a contributing factor to the depletion of moisture from the soil, during long periods of hot, dry weather. 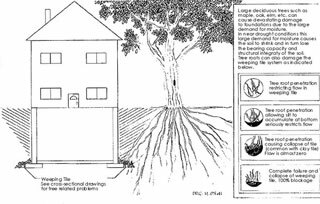 In a City of Ottawa publication titled, "Trees & Foundation Damage", they identify the dominant soil in the Ottawa area as "LEDA CLAY", a marine silty variety with a high water content. When Leda clay loses water, it shrinks and doesn't regain its previous volume. This shrinkage of Leda clay is a major contributor to building foundation damage in our area. An excellent report titled: "Understanding and dealing with interactions between trees, sensitive clay soils and foundations" can be found on the Canada Mortgage and Housing Corporation website. Another informative bulletin can be found on the website of The National Research Council of Canada, Institute for Research in Construction; in their publication Canadian Building Digest, titled: Trees and Buildings. Each Spring and Fall, Ottawa-Carleton homeowners find themselves confronted with an unpleasant side effect of our seasonal rain/freeze/thaw cycle - Wet Basements! Chronic water leakage is a serious problem that can destroy personal property, as well as depreciate your home's property value. No one wants to renovate a wet basement nor store anything of any importance down there. You don't want to work there and you discourage your children from playing there. A wet basement deprives your family of usable living space. Excessive moisture can also create a breeding ground for insects, mold and mildew, not only unpleasant......but a potential health hazard. Fungus and mold can contribute to chronic colds and respiratory ailments. Water can enter your basement many different ways. 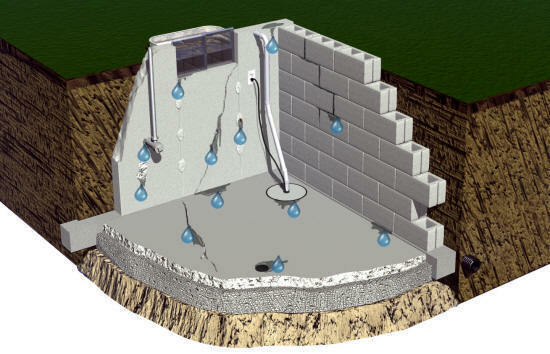 Below is a picture of a basement which illustrates common leakage points. The wall on the right is a masonry block wall and the wall on the left is a poured concrete wall. If you see your water leakage problem, click on the "water drop" closest to it for an explanation of the problem and the services we offer to correct it. If your basement is finished and/or you can't determine the source of the water infiltration, call our office at 613-226-1234 to schedule a consultation and estimate. At the time of construction, consideration should be given to the final grading of a property, to ensure that the top of the foundation extends several inches above ground level. While making landscaping improvements, homeowners likely will want to add hard surfaces (interlock, asphalt) and install planting beds for flowers and shrubs, altering the grade around the foundation. These alterations may create a way for water to seep through the brickwork or siding and flow over the top of the foundation wall. Water woes could also lay ahead for properties situated lower than their neighbours as this scenario would permit water to drain from their properties to yours. Our estimator will likely recommend that the problem be fixed from the exterior. This is usually accomplished by lowering the grade and sloping it away from the house. It is a good practice to inspect your exterior cladding and windows annually for signs of deterioration or moisture infiltration. The place where your floor and wall meet is called the "cove joint". When we have heavy rain for prolonged periods the weeping tile may not be able to handle the volume of water, resulting in a backup of ground water under the basement floor and along the foundation walls. This is referred to as hydrostatic pressure. Our estimator will recommend excavation and repair or replacement of the exterior weeping tile or installation of an interior drain tile system. The repair will be determined following investigation of numerous factors specific to your property. Gas, water, sewer and electrical lines are common examples of the types of pipes which you will find penetrating your foundation wall from the exterior. Typically, at the time of installation, these pipes are sealed with a patch from the interior and the exterior. These patches often fail with time, disintegrating or falling off, creating an easy entry point for water into your basement. Our estimator will recommend an exterior repair which includes excavation, sealing the area with non-shrink grout and installation of Platon Foundation Protector with clear stone backfill to create positive drainage to the weeping tile. The most common source of wet basements is leakage through a wall crack in a poured concrete foundation. These cracks occur often due to stress, settling and/or shrinkage during the curing of the concrete. The majority of these cracks tend to run from the top of the foundation to the bottom of the wall. They usually penetrate all the way through the wall, creating an easy point for water to enter your basement. The crack will be obvious in an unfinished basement. If the basement is finished, our estimator can usually find the crack on the exterior of your basement wall. We offer solutions from both the exterior and interior. A Polyurethane injection process can be used to seal the crack from the interior. This involves sealing the crack on the inside with a cement paste and injecting a polyurethane material through the crack to the outside where it meets soil. Polyurethane adheres to the concrete inside the crack, forming a flexible, rubbery gasket that immediately stops water infiltration. Exterior repair involves excavation (full-depth) to expose the footing, sealing the area with non-shrink grout and installation of Platon Foundation Protector and backfilling with ¾ clear stone. Either method of repair has proven to be effective. Tie Rods are the pieces of steel used to hold together both sides of the concrete forms when a foundation is poured. Upon removal of the concrete forms, the ends of the ties are broken off, leaving the embedded steel rod in place in the cured concrete. With time, these steel rods can rust, creating an entry point for water. Leaking tie rods can be repaired from either the exterior or the interior. Our estimator will consider site conditions and recommend the most practical solution. Basement floor cracks are very common, usually resulting from shrinkage during the concrete curing process. Other causes include soil settlement under the floor and/or shifting of the foundation. Most of the time these cracks do not leak water and present only cosmetic inconvenience. Unfortunately, if hydrostatic pressure is present, water can be forced up from under the floor. Sealing the floor crack to stop the water from entering is not recommended as this would only force the water to follow a path of lesser resistance and it would find another entry into your basement. Typically, our estimator will recommend installation of an interior drain tile system to relieve the hydrostatic pressure by draining the water under the floor to a sump pump which will flush the water away from your foundation. Porous concrete can be found in new and older concrete walls. Honeycomb concrete occurs when concrete is poured. It is often the result of poor consolidation and can be identified by the separation of cement between the aggregate. Concrete can become soft as it ages, resulting in crumbling and surface erosion. This is called spalled concrete. Our estimator will recommend an exterior repair as this is the most reliable method to eliminate water seepage through porous concrete. This repair involves excavation to expose the leaking areas and installation of Platon Foundation Protector followed by backfilling with excavated soil. We have products which are effective from the interior and may suggest them in some situations. Water often accumulates in window wells. In situations where large amounts of water have accumulated, it can pour through the window and/or window frame into the basement. Our estimator will recommend an exterior repair which includes excavation of the window well and installation of Platon Foundation Protector with clear stone backfill to create positive drainage to the weeping tile. This is a good time to replace rusted or deformed window wells with a new corrugated well, ScapeWEL® or Stakwel®. Block (masonry foundations) and stone foundations are constructed with mortar to keep the masonry units in place. With time, this mortar can deteriorate, permitting water seepage through the open joints and into your basement. We offer both exterior and interior solutions to this problem. Exterior repairs involve excavation (full-depth) to expose the footing. Once the foundation is exposed, minor repairs to the surface may be required. Platon Foundation Protector is installed with clear stone backfill to create positive drainage and a new weeping tile system will be installed. Our interior water control method is called an interior drain tile system. We install Platon Foundation Protector and utilize the "air gap" formed by the membrane to drain water to an under floor drain system which may be connected to a sump pump depending on individual site conditions. The under floor drain system is installed in a trench formed by breaking out existing concrete around the perimeter. This trench is later sealed with new concrete. A sump pump is an electrical devise which is installed at the bottom of a pit below the basement floor. Its purpose is to collect water which may be draining from an exterior or interior weeping tile system or to relieve hydrostatic pressure under the basement floor. If your house was built after 1950, your weeping tile is most likely connected to the sewer system. If your house was built prior to the 1950's, there likely is no weeping tile system. In this case the sump pump would function to release only hydrostatic pressure under the basement floor. In the event of a foundation repair, a weeping tile systems can be installed and connected either to a sump pump or directly to the storm sewer. Battery back-ups are available to keep sump pumps working during a power failure. Floor drains are installed at the lowest point of the floor in basements, to collect spilled water, i.e. washing machine overflow, and drain it before it can accumulate. Water coming up from the drain is usually not waterproofing related and often indicates a problem with the sewer system, i.e. sewer back-up. See City of Ottawa: Residential Protective Plumbing Grant Assistance Program. Copyright © Ottawa Structural Residential Services Ltd., 2016. At Ottawa Structural Residential Services Ltd. we take our customer care very seriously. Please contact us if we can be of assistance.